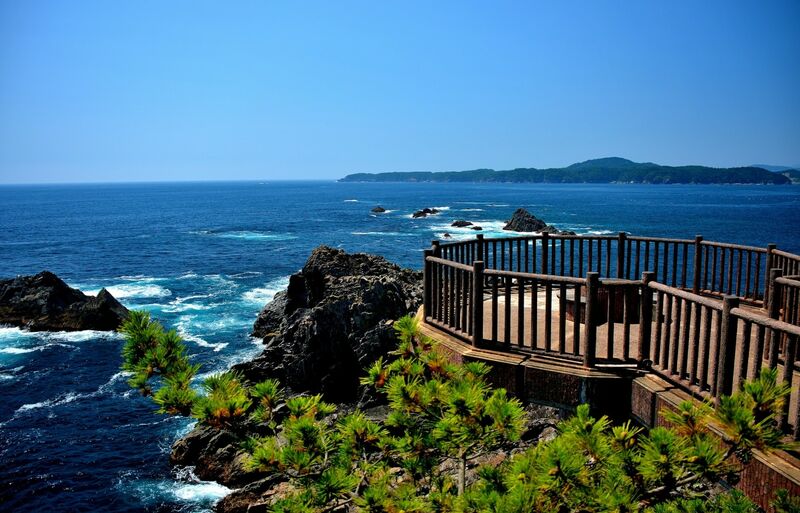 Designated a National Place of Scenic Beauty, Goishi Coast (or Goishi Kaigan) is six kilometers (3.7 miles) of pristine Pacific coastline in Ofunato, Iwate Prefecture. Along with other All About Japan editors, I headed to the region, part of the Sanriku Fukko National Park, to see the natural splendor for myself. We were certainly not disappointed! We were incredibly lucky to have perfect weather the morning we headed down to Goishi Kaigan. You can see in the video above that the sky was completely free of clouds and we had the entire space to ourselves as we rested on the observation deck before making our way down to the rocky beach below. To begin our journey, we started at the Goishi Misaki Lighthouse, a great lookout point. Behind the lighthouse, and down a set of stairs, awaits a spectacular deck with dramatic panoramic views of the coast and the craggy rock formations. Goishi Coast is named after the Japanese board game “Go.” The stones (ishi) resemble Go pieces. The stones on Goishihama (hama means "beach") not only have an interesting appearance but the soothing sound the waves make after washing over the smooth stones is also worth noting. Especially in contrast to the thunderous roar of the impressive kaminari iwa, or thunder rock, where the waves sound like the roaring sky has opened up. Try closing your eyes and imagining a tumulous storm battering the Iwate coast. One interesting feature of the coast is that anything that makes its way down to the seaside might start to also resemble the polished stones over time. Besides rocks, we also managed to find old ceramic roof tiles, pieces of metal and styrofoam all smoothed down over the years as the water washed over them. A rental car is recommended to get here. However, once you arrive, you can breathe in the fresh coastal air at the observation deck as we did, or hop on a sightseeing boat to take it slow while fully enjoying the view. Either way, you'll truly appreciate the natural beauty of the region and enjoy a much-needed break from the fast-paced and crowded metropolitan areas.